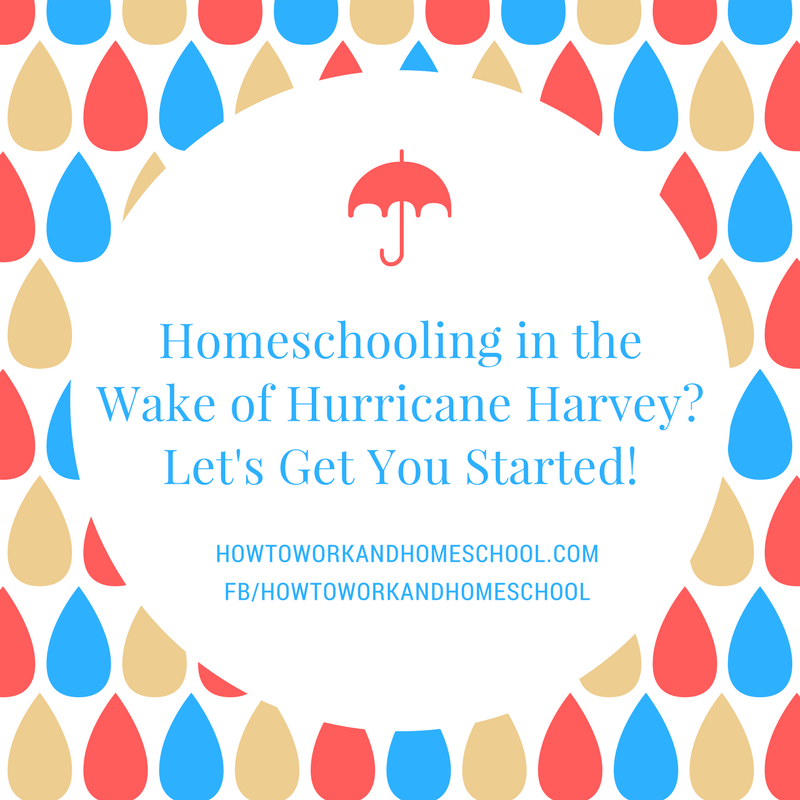 Need to Homeschool in a Hurry after Hurricane Harvey? Start Here! 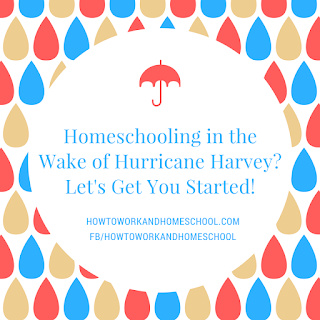 As a Texan, I'm hearing reports of families planning to homeschool in the wake of Hurricane Harvey. This is an understandable reaction, especially with so many school closures in the area. 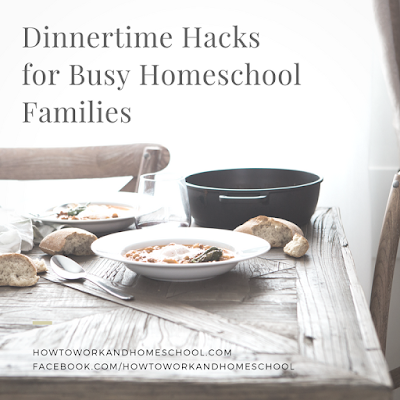 Because parents who opt to go down this path (even temporarily) are juggling disaster recovery with homeschooling, it's similar enough to "working while homeschooling" for me to feel comfortable making some suggestions rooted in my years of coaching parents. Step 1: Assess your schedule. If you're reclaiming your life and belongings from wind or floods, then you're only going to have so much bandwidth to dedicate to teaching your kids. But here's the good news: most people vastly overestimate the amount of time it takes to teach a child at home. 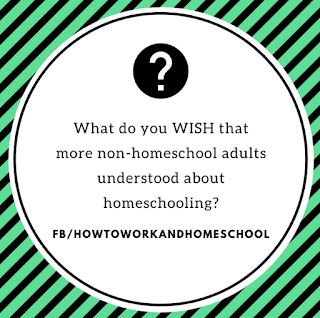 Yes, you can "school at home" and spend 8 hours doing academics, but most homeschoolers I know do not spend a full day, every weekday on teaching. Tips for creating a schedule that helps you, the parent, juggle needs can be found here. Step 2: Keep the curriculum simple. For tweens and teens, curriculum options get trickier because of the complexity of their academic load. Thus, I'd suggest, if you have more than one kid, that you focus on sorting out the plan for the oldest kids first and then move down to the younger kids. Step 3: Ease into things. Step 4: Supplement learning with online options. Step 5: Don't forget that life itself offers the greatest lessons of all. Whether its helping you calculate how much wood to purchase to fix a rotten door frame or helping unload groceries, essential lessons of living are waiting for your children, yes, even in the wake of this disaster. In your understandable eagerness to get back to normal, try to remember that we parents can be ideal teachers for our kids. Trust that you can teach your own. And don't forget: we're all pulling for you! Have questions? Need support? 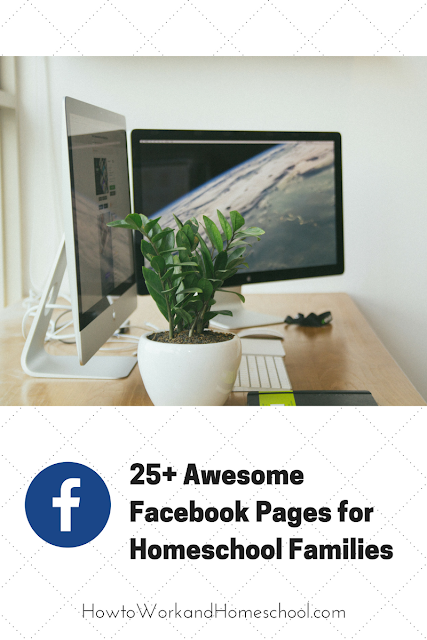 Reach out to the How to Work and Homeschool Facebook community. I've included a link to Brain Quest Grade 1 in this Amazon ad, but there are other grade levels. This post is the first installment of a series about working homeschool parents. In truth, this project is something I've been wanting to do forever, so I'm excited to see where it leads. I work as a contract dietitian part-time. I'm on an as-needed basis with a couple of hospitals, covering vacation/family leave for other dietitians. I also do employee health training and facilitate support groups. My weekly work schedule varies from zero to forty hours, but on average it’s ten to fifteen hours. I also do a lot of volunteer things—attend public events for nutrition education, serve on a medial advisory board, and work for my chosen religious organization. Luckily, some of that can be done at home. Tell us about why you chose to homeschool. My youngest child is five and will be in “Kinder" in the fall, but we are already doing homeschool-type things at home. Our son has severe allergies, and we keep a tight schedule of various therapies and specialist appointments. That's why we're homeschooling primarily, for medical reasons. I may also teach my teenager at home next year, but that’s still to be decided. 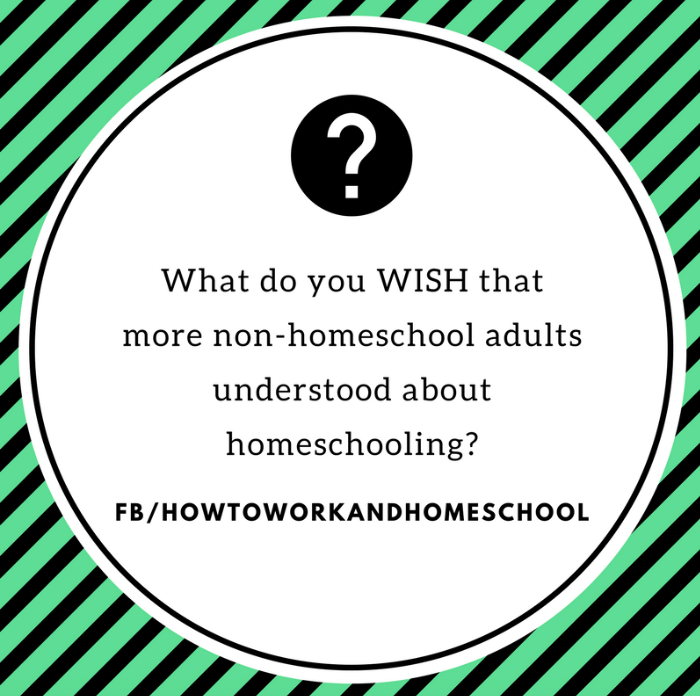 What are some of the challenges you face balancing working while homeschooling? What are some of the delights? There is a lot of work on the front end here with preparation/planning, since I am a beginner. As I get older myself, I'm finding it a little harder to multi-task, but that may be because I have so many tasks to juggle: the ever-changing work schedule, school stuff, medical stuff, carving out time for family fun, and house maintenance. Since I am an introvert, it has been challenging to seek out groups and play dates. At the same time, being an introvert helps me, since I’m focusing on one child right now. Honestly, it's a delight spending time with this hilarious kid, and I love that he's getting more science at home than he would in a traditional school. Also, my mom watches him when I'm working, and as a retired teacher/children's librarian, she's fully capable of helping with homeschooling. Whether we work or volunteer outside the home or just spend a lot of time and energy keeping our households running smoothly, sooner or later we homeschool parents finding ourselves running out of steam. More often than not, that problem seems to coincide with the dreaded “arsenic hour” which in turn coincides with the need to nourish everyone before bed time. Phooey to all that hunger-charged chaos, right? Well, with the right tools and strategies in place recommended by veteran homeschoolers, you can say “L8R!” to supper hassles. Join Us on Facebook for Our New How to Work and Homeschool "Theme Weeks"
My plan is to host at least one theme week per month, although sometimes there may more. 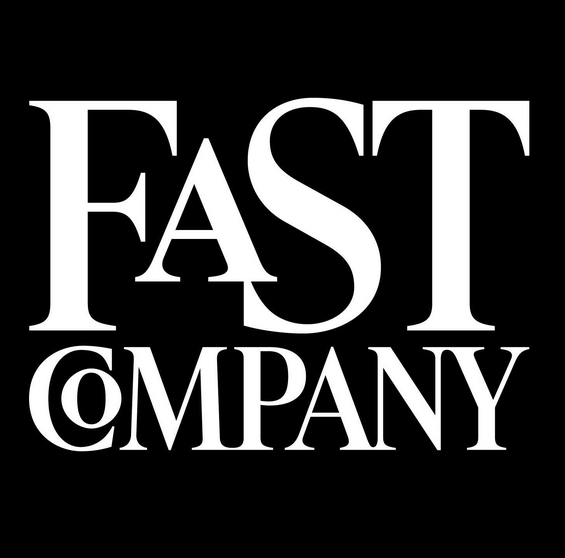 Basically, as long as it seems to foster community, we'll keep working with the model. As a demographic, we're busy and spread out across the country globe. Still, just like any other group, it's nice to chat between ourselves and learn what works and what doesn't for other folks. If you haven't already found and followed us on Facebook, I hope you'll take a moment to do so. 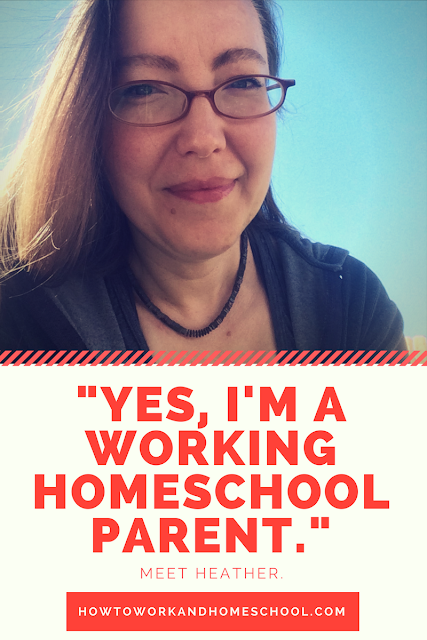 And stay tuned to this site where I'll soon launch a new series featuring interviews with real-life working homeschool parents from all walks of life. It's a project that I've been wanting to do for awhile, and I'm eager to see what you all think. Maybe you're new to homeschooling and are just getting your bearings. Or perhaps you're a seasoned homeschool parent seeking some inspiration. Either way, the following compendium of quality Facebook pages will give you food for thought. Some pages are large; others, small. 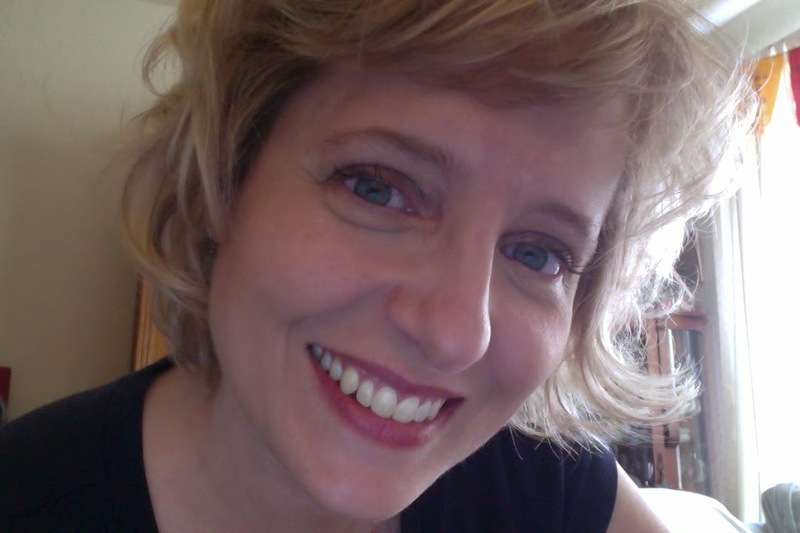 Some target homeschoolers, and others have a more general academic focus. Still each of the following pages offers ideas, reliable links, information, and, in some cases, services to homeschool families. Find and follow your favorites, and soon you may find that your Facebook feed feels a little smarter.